The Milford road is often described as one of the most scenic drives in New Zealand, and one of the reasons this area is so special. 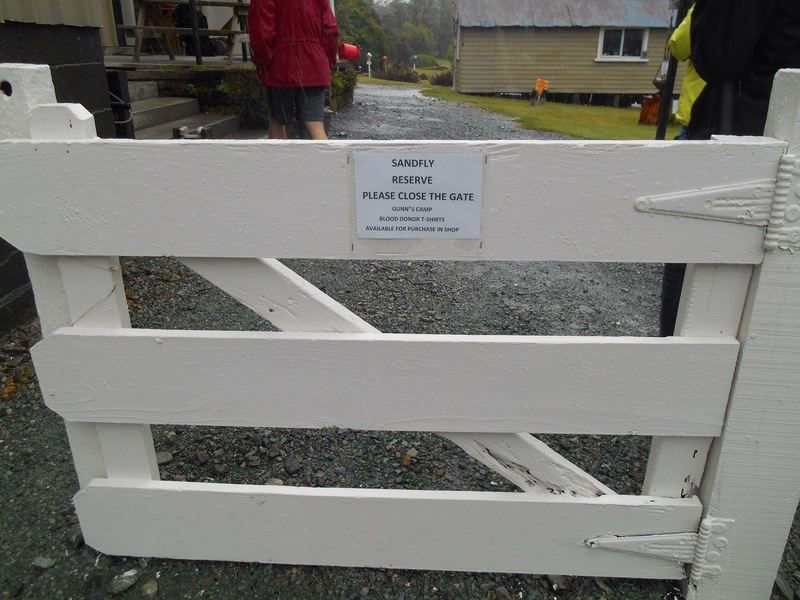 From Te Anau it is 120kms, with no phone signal, petrol stations or amenities. You pass the last of the farm lands and then enter the dense bush of the Fiordland national park. The landscape is marked out by glacier making some pretty incredible and diverse markers. Knobs flat is a valley with many humps, the remains of rocks a debris left behind by fast moving ice. The Eglington Valley is also remarkably flat, margined by mountains. There is the lakes, big and small, choppy or reflective as a mirror. Then comes the incredible feat of reaching Milford. The postman used to traverse the mountains to deliver mail however in 1946 the Homer tunnel was completed. This roughly carved out entrance starts at 946 metres above sea level and drops at a gradient of 1 in ten, in the dark, revealing the spaghetti road down into Milford. Incredibly, these mountains divide the weather to such an extent that you can emerge into completely different weather to what you left. From the Milford side of the tunnel you are down at sea level within an ear popping 20 minutes. Apart from its fascinating natural history, the physical work that went into making Milford accessible holds many stories, and claimed 3 lives. The tunnel was finished in 1946, and up until this point many men and some families lived along the road. Markers of this include a clay bread oven at the roadside, and the pesky lupin which has taken over much of the drive, planted by families who wanted to beautify their surroundings. There are many side trips to be taken, and on one wet day Frazer and I went up through the tunnel to explore around Gunns camp. 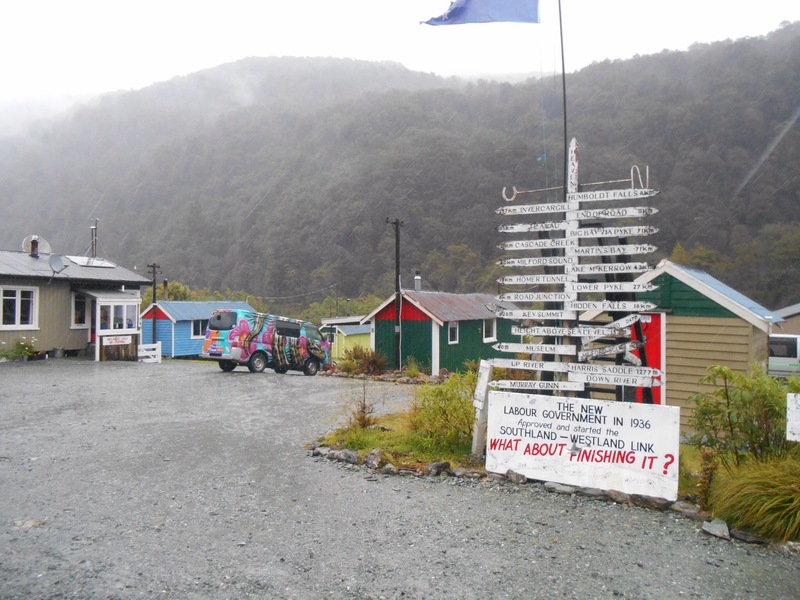 The only turning off the river takes you to the Hollyford river, at one time planning to connect Milford to the road network on the west coast of New Zealand. Here lies a colourful camp where workers and families resided, so painted to antagonise the department of conservation who maintain the park. Technically our ‘local store’ we needed to check out the amenities which mostly include a small store, small museum on the tools and making of the road, and a big dose of sense of humour. Living this remotely must drive you to something pretty strange. The surrounding area is filled with falls all heading for the Hollyford river which within a few days walk, reaches the coast. We scrambled up to overlook the Humboldt falls which cascade beautifully down the mountainside. Very soon a deluge of rain began, only to add to the falls as we made our way back into Milford, appreciating how our remote existence is no where near as remote as things would have been before the work of these men. It sounds magical and incredibly beautiful. A privilege to call it home. Even the high rainfall fails to dampen the joie de vivre that leaps out from your words.